Overcooked is a multiplayer-centric cooking game where you and a bunch of chefs run around a kitchen trying to fill as many orders as possible. It’s available to download on most of the current game consoles, and now there’s a Special Edition you can get on the Nintendo Switch (reviewed here). I’m not sure exactly what’s added to the Special Edition, but we’ll take a look at all of it anyway! 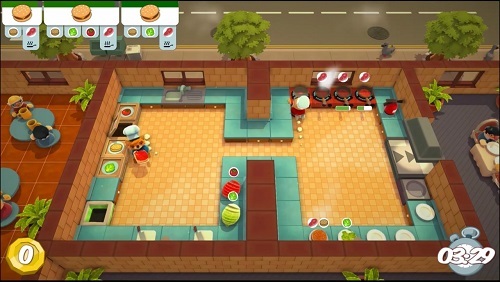 In the game, you run around 2-D top-down viewed kitchens. Play control is easy. Just use the stick to move and one button for carrying food and another for chopping it. On certain cabinet tiles are stations where you can do things like pick up ingredients, chop food, cook it in a pot or pan, a place for sending out completed orders, and a sink. Chopping food requires a bit of time, so while one chef does that, another could be doing something else. Cooking food in a pot or pan also takes time, but you have to watch it so that it doesn’t burn. You must also make sure you have plenty of plates to place cooked food on, otherwise you’ll need to take dirty dishes to the sink and wash them. Completed orders will boost your score, and if you can make them fast enough, you’ll earn more points with tips. To pass a stage, you’ll need to earn a certain score to get a star. There are three stars to get in each stage, and you’ll want to collect as many as you can because you must have a certain number of stars to unlock new stages. Each kitchen has a different layout with new obstacles for you to watch out for. For instance, an outdoor kitchen may have a crosswalk with people who might get in your way. A ship’s galley rocks back and forth, and tables will shift, changing the playfield. Or mice can come and steal your food if you leave it out for too long. And there are many more different obstacles as well! Completed stages will also unlock new playable chefs and versus mode kitchens. You can play the game single player, and you’ll control two chefs one at a time. So you can take one chef and have him chop food for a while, and then switch to the other chef to do something else. But it’s really hard to earn multiple stars that way. The best way to play is with more people. Up to four can play the main game, but I was only able to play with one other person because it’s hard for me to get four people at once to come over and play games anymore, and also because I only have one pair of Switch JoyCons. Those things are hard to find and a bit pricey, too. With two players, you can divvy out the duties and it’s a bit easier to earn stars on certain stages. But it’s not too easy! There are also two separate smaller campaign modes. The Lost Morsel features some super hard stages on a jungle island, and The Festive Seasoning, which has more wintery, Christmas themed levels. I think they must’ve been DLC on other consoles, but are included in the Special Edition on the Switch. And finally, the game has a versus mode where two players compete to cook the most orders and get the highest score. I’m not sure if four players can do this mode, but when two do it, you have two chefs each and must switch them out like in the single player mode. Overcooked is a very challenging game, but still a lot of fun. Especially if you enjoy cooking games and have a bunch of friends who can play it with you. Overcooked is rated E for Everyone with an ESRB descriptor of Mild Cartoon Violence. I really didn’t notice much violence at all, really. The opening scene shows a post-apocalyptic future with a giant spaghetti and meatball monster, but it’s more silly than anything. You can fall off ledges in certain kitchen stages, but you just have to wait a few seconds for your chef to respawn. You can also set the kitchen on fire and must use an extinguisher to put out the flames, but it just keeps you from preparing food. Reading skill is helpful for some of the text, and younger gamers may find it a bit too challenging. But the game does encourage teamwork and multitasking skills.